A complex set of environmental factors and human impacts, including geochemistry, limnology, climate, land use, and invasive species, have contributed to a shifting ecology of Clear Lake. If you are interested about information regarding current lake levels, flow data, aquatic plants, or algae....see the Lake County Department of Water Resources website. Many of the above impacts (largely introduced fishes) have altered the food web in the lake. 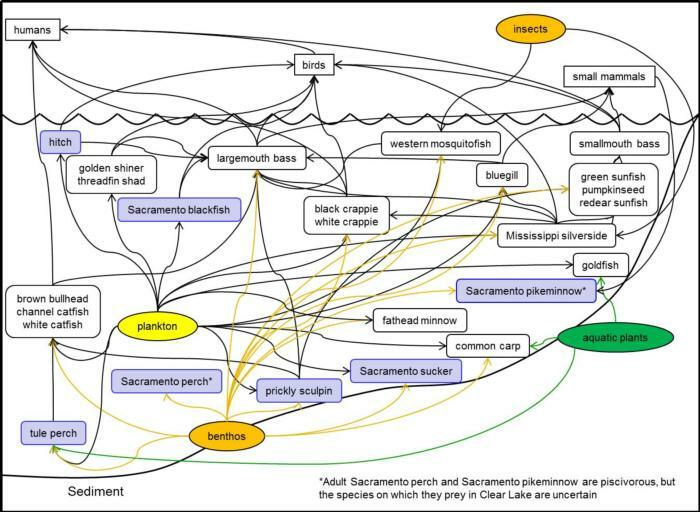 See the Clear Lake food web below. If invasive species become established in a watershed they can alter the ecosystem and negatively impact the local economy. The Clear Lake Invasive Species Council, the Lake County Invasive Mussel Prevention Program and other groups work to insure that certain invasive species don't reach Clear Lake. For example, Quagga and Zebra Mussels are ABSENT from Clear Lake but can be found in other California waterways. For more information regarding Quagga/Zebra Mussels, Hydrilla, and other invasive species, see the University of California Cooperative Extension Lake County website. The California Sea Grant Extension Program maintains the Aquatic Invasive Species Eradication and Control website, with a focus on Quagga and Zebra Mussels. Clear Lake Food Web. Blue bubbles indicate native fish species. White bubbles indicate non-native fish species. Adapted from Suchanek et al. 2003 (Fig. 121.12), with the addition of three native fish species: Sacramento pikeminnow, Sacramento perch, and Sacramento sucker, and five non-native species: fathead minnow, golden shiner, pumpkinseed, redear sunfish, and smallmouth bass. The native species California roach, rainbow trout, and threespine stickleback were omitted because they are rarely observed in the lake. Similarly, non-native brown trout were omitted because they are rarely observed in the lake. Reproduction of the figure above must contain notice of the Regents of the University of California's copyright as follows: Copyright (c) [year] Regents of the University of California. Figure by Lisa C. Thompson and Gregory A. Giusti.